Placed between the Ghelenea's seas and the Mihr'mid, Winderhnonth is a giant peninsula, with a rigidly cold climate in the north, mild in the middle and intensely hot in the south. Founded by King Yjhzin Ghirteof the Mighty, a human with great magical powers, Winderhnonth was called at the time Yjhzin'dun, translated in modern language into "the land of Yjhzin" . Within a decade, after bringing all his possessions in the now known city of Nihfertad, queen Helemirna gave birth to nine children, all with great magical powers. They were, in order: Azàloth, Noogran'mahnt, Vihndur'tuhn, Bolijtr, Viden, Fushgout, Lumnia, Ihditzious and Ohrt'boodt. About twenty years later, for old grudges and disagreements on the policy to adopt for the throne, the nine brothers were divided into two leagues (with the exception of Viden, which remained in Nihfertad), the Ice one of Azàloth and the Fire one of Fushgout. In the years that followed, the League of Ice became a known military power, employing the majority of its trade with Ghelenea, the motherland of Yjhzin, while the Fire League created a huge business empire with the lands beyond the Mihr'mid and based his power on the alliances created there. Soon, however, a ruinous war broke out, which was renamed the War of the Leagues, who nearly destroyed Winderhnonth itself. The war ended when the elderly and tired Yjhzin died, and the brothers could get together without spilling more blood. With the death of two brothers on both sides, however, the tensions didn't end there. In the cold north, Noogran'mahnt experienced a spell that was supposed to keep alive both he and Azàloth, but something failed and this resulted in a massive green explosion, on the Ghelenean border. This event is remembered as the Great Green Glow, as well as the birth of Thundammah, the Kingdom of Eternal Frost, and the conversion of its inhabitants into undead creatures immune to the elements of that land that is still virtually inhospitable. To the south, however, a great schism between those who wanted to serve the Thundammah and who, instead, wanted to remain independent and to trade per se broke out. And so, this created two new leagues: that of the Fatuous and that of Pure Fire, which sparked in a brief war between the two factions which, however, ended when it was decided to cooperate better in order to live in peace, and so was born the Fìhran'dun, the Hot Scorching land. The region which was located in the middle of the Thundammah and the Fìrahn'dun, leaded by Viden, Lumnia and Bolijtr, was renamed Norvodhijn, the Lush Land. Subsequently, once all the major tensions ended, was decided that the three regions had to live under a single flag, and that's how was born Winderhnonth. Winderhnonth is reputedly the richest land (in the field of races) in the New World. - Human and Ogrites: one of the most prolific, the human races are known for their wit and cunning, but also for being great scholars. They are considered, from breeds like goblinites or dragonites, their likes. The problem, though, is that humans tend to be very suspicious in other breeds and many do not shine in intelligence. The ogrites, however, are the wild and deformed counterpart of the humans. Regarded as a progeny of evil, an ogrit has an intelligence equal to that of a five or six year old child, even if the tribal leaders are much more intelligent (people are talking about like a boy of fifteen). Mainly carnivorous, if they encounter long periods of famine they may also fall into cannibalism, but given the large number of members belonging to a single tribe is the quickest solution of all. - Goblinites: This category covers, for the most part, orcs, goblins, trolls and humanoid greenskins or half-greenskin. The orcs are known to be fierce warriors and great blacksmiths, goblins cunning thieves and silent murderers and trolls ... well, to be living battering war rams. Contrary to what humans and elves may think, the goblinites are a very sociable race and can adapt to many environments, but discrimination made during the reign of Yjhzin have branded them as monsters, and so now they are closed much as the dwarves, preferring life with their like. - Frost Elves: very rare outside of the Thundammah, these elves are repudiated by their own kind of the south regions for being undead. Having lost their membership and contact with the magic of the forest and nature, the frost elves exploit the unnatural magic of the Thundammah in their favor. Socially they live in the region in the north-west of the land of eternal frost, near the Green Gash, a dangerously zone haunted by the residual black magic of Noogran'mahnt . - Dwarfs: the most human-like creatures, it is said that the first dwarf in history has born from the hard rock of the great mountains on the border of Norvodhijn. Experts and ingenious mechanical and skilled miners, their majestic constructs are the pinnacle of the winderhnontian technology. They, however, are a very closed community, and rarely sell the patents of their best technologies (such as the molten Brizina Engine) or interact with non-dwarven communities. - Thunda'hirl: the inhabitants of Thundammah, undeads similar to humans but tormented by the pain that grips their dry and cold bones. A thunda'hirl could never live outside the Thundammah for too long, because it would die of heat. They are the only sign of intelligent life beyond the Ghirteofnian Wall. - Dragonites: also called Draconities, they are the last descendants of the ancent dragons. Physically, a dragonit resembles a human, but the hind legs are made to also walk on all four and their bodies are stretched and, in most cases, slender. Like their ancestors, they have horns of various types and sizes, long and muscular tail and the ability to breathe fire, although this is a skill now almost lost. Unfortunately for them, their wings have been athrophied over the centuries, and are now good only to glide. In battle, they are formidable swordsmen and terrifying rampage by the thick skin like steel (however, except on the belly). - The giants: It is not known how they were born, much less if they still exist, but some voices speak of a population of giant humanoids in the mysterious island of the clouds, an atoll surrounded by a dense impenetrable fog. The giants history go back to the First Centuries, and are said that they are the first children of the gods, then corrupted by rage and by Infaeria's demons. Their major characteristics are to be extraordinary creators of weapons and armor, and they can also be immortal. -Ghoul: reputed more a legend than a real danger, the ghouls are cannibals undead beings , devoted to eating only until they explode and continue afterwards. A ghoul is a being created by necromancy performed on a living being, and this destroys the soul and mind of the victim. Becoming a ghoul is a very common occurrence among novices necromancers, but it become much easier if someone live near the Green Gash. -Drukt: until now, they aren't yet considered a real race by human, elven and dwarven communities. A drukt, in short, is a being born from the union of two different races. They take the strenghts and weackness of their parents, compensating by both sides with unique abilities of either races. They are considered aberrations worst then the ogrites, and discrimination against them varies with the dismissal of the individual (as in the case of the dwarves or humans) or the newborn physical elimination (classic of the elves, who see them as a blasphemy). Well, this is just an idea. I will be happy if you share some possible ideas to add, so I can start write the first story. Greetings. I see you have put a great effort into this. It has the potential to be a dynamic world, and I'd like to help you steer clear of one particular pitfall. What language is each of these words in? How are the following graphemes pronounced? So, all the word you have write are example of names and winderhnonthian words: Mihr'mid means Great Ocean, while Fìhran'dun means Land of Heat or Drukt means Halfling. Thundammah is not a proper winderhnontian word. This kind of language is called the Ancent Speach, and is speak only in the northest region of Winderhnonth, mostly by Thunda'hirl or the Thundabihor (the King of the Land of Eternal Frost). 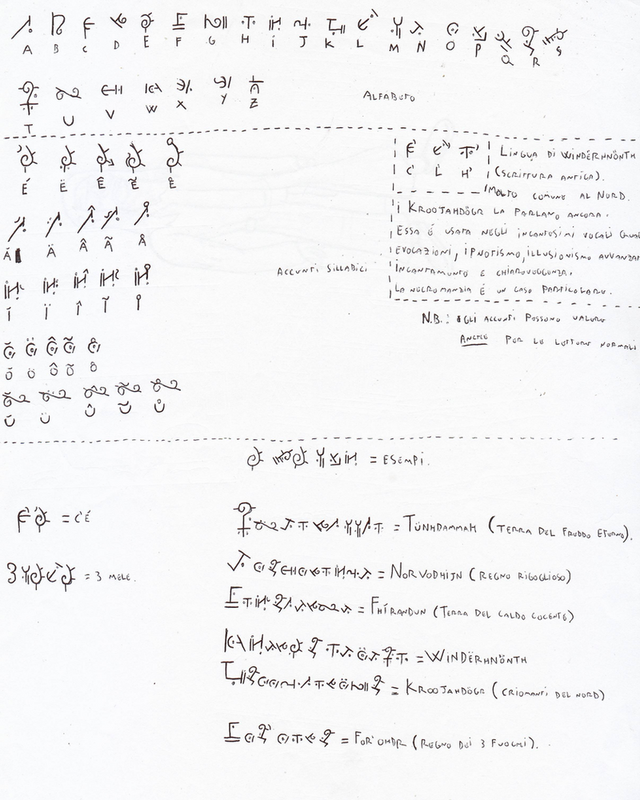 This is said to be the native language of Winderhnonth. Ghelenea is the name of the vast empire just north to Winderhnonth, the native homeland of the Ghirteof ancestry. As said before, Yjhzin Ghirteof come down to explore the once known Yjhzin'dun ( wich the local called Yjhzinmmah, since Winderhnonth had not a proper name for a cultural myth). - à or ì: this two differ form region to species, and not always are used in all Winderhnonth. For example, " ì " isn't used in the Fìhran'dun, and is replaced with " ï ", while among the thunda'hirl both are pronounced as "hän" and "häé" ( for example, the name of the thundabihor is pronunced Hänzaelot, while Fìhran'dun is pronunced Fhäéren'tzuhn). - Since Ghelenea have something like a ancent latin base, ae, ea and eo are mostly unchanged, while ia and oo have a slightly modification: ia become jh?n, while oo is pronunced ae in the Thundammah ( the name Noogran'mahnt becomes Naegrin'maehntz, and Lumnia is Luhmnjh?n ). Ou... well, i don't have a real idea for it. Here, this is what I came up with. I have a lot of other ideas, such who can use magic or the jobs who someone can actually practice or the Companies and the Guilds. After this grammatical clarificaitons, if you are interested, I can put them here . Thank you for the clarifications. I presume when you say "unchanged", you mean in relation to Italian orthography? Most of those words seem very consonant-heavy and hard to pronounce, even if the reader's native language is English. Since the Winderhnonthian common tongue is spoken by humans, its phonology would tend towards the simple. As far as I know, there is no Y in Italian, and JHZ & GH are no different from J & G in English. Ditto for EO & O in Latin. If the ruler's name would be equally well conveyed by "Ijin Girtof", why not spell it that way? At the risk of sounding harsh, I want to warn you of the dangers of overcomplicating. Exoticism by way of áddëd dôts causes more harm than good. If you yourself aren't sure how a word is pronounced, how can a reader ever be? A wise language builder starts by picking the sounds used in a language and sticking to them. This place contains a detailed guide for that process. Keep it up, your world deserves good quality names!